"Fi has passion, energy, enthusiasm, and patience for days! Her excitement for Japan..."
"After experiencing Japan with One Life, I am already planning my next adventure with..."
"I saw so much in so little time and enjoyed the options of activities to participate..."
"Getting to see the life size gundam, and the group environment"
"Trip was great! We had a great guide and we managed to do so much in two weeks." "The tour was great but with out van ratha it wouldn’t be the same he made my holiday..."
"I had an amazing time on this trip. It was a great group of people of mixed ages..."
"This tour was special for me. EuropaMundo has been professional from before the tour..."
"It as good having the flexibility to either take Tsunao's suggestions or go your..."
"The itinerary was packed full but this allowed us to see so much around Japan in..."
"I really enjoy the places that we are brought to but I wish we had a bit more time...."
"We saw really a lot within a short period of time." "The tour is good and informative. Accommodations are mixed experiences, one or two..."
"We actually did a customized tour on our own with an itinerary closely resembling..."
"Had the best time! Shan our tour manager was awesome and really made everything easy." "SO MANY INCLUSIONS for such a cheap price! This is not a tour where there are lots..."
"Itinerary was great. I chose it as it avoided Hiroshima. Khaosan hostel was great..."
"My Topdeck experience was phenomenal. 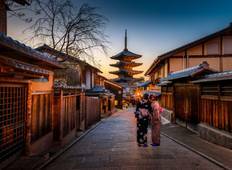 The trip was extremely well organized and structured..."
"Great way to see Japan. Everything went great! Good group of people. 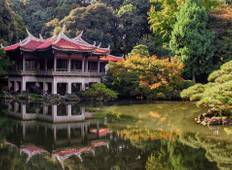 Great guide.The..."
"I booked Japan on a Shoestring to see what value a tour company could add compared..."